Mark is a former Chester-le-Street member, and joined DARC nearly 2 years ago. He was in the Royal Navy, and was a Sales Manager for Debenhams. I started when I was 12. I was at school in Washington, miles from the nearest river. There was a girl who was involved in the Chester-le-Street club and I went along for a session, and that was it, I was hooked from the first time. I’d probably say coming 3rd in Intermediate 1 eights at the Metropolitan Regatta with a strong DARC crew – and that pre-qualified us for Henley. I can’t think of one. I’ve never fallen in. You’ve got to be very specific .. the numbers are very important. There’s no point in just jumping on an ergo, you need to have a target .. and that means fast, as well as slow. Long slow work is also important, and most people don’t do enough of that. Playing golf … I’m desperately trying to reduce my rowing to play more golf. I’m involved with the Durham County Golf Partnership (who oversee participation in the sport) .. the whole family play golf, and I’d like to fit in a lot more. Probably another 20 boats with somewhere to store them .. and an Empacher eight! I’ve seen you around the club doing a lot of good coaching work. What draws you to that? I’ve always been good at training people. I’ve been doing that in every job I’ve done, as a Sales Manager, and in the Navy. Maybe it’s a style of being very thorough, and understanding how people learn. When I was doing my 6 stage coaching plan, I discovered the best way of teaching people by trial-and-error, and now I know how to replicate that. So, for example, always start people first in a single before they get into a crew boat ..
Why? If you can’t do it on your own when you’ve got time to think, then how can you do it, when there’s 3 other people you need to be in time with ..
.. and you learn about how the boat moves. I like people to do at least 2 sessions in a single first. I’m amazed that there are people off ‘Learn to Row’ who have never been in a single … and of course by single sculling, you learn to be independent and you can go out on your own if there isn’t a crew. I think you should learn to scull before you learn to row. I see youngsters come down and they want to go out in a double, maybe they think it’s ‘safety in numbers’ .. they have no real idea of the skills levels involved, steering as well as sculling. I think you’ve seen the Members Survey which identified that coaching at DARC was very ‘uneven’ – some people got a lot, with some great, passionate, coaches, but for others it was difficult to get access to coaching. What’s your view on the state of coaching at DARC? When I was at Chester-le-Street, I thought Durham must be an amazing club. Then I came down one Monday night, thinking of joining, and there was no one in the gym, no-one on the ergos. I expected every squad would have a coach, and every squad would be training together … but it never really materialised. That’s what we’re trying to do now – so that everyone has access to coaching. I still think it needs a lot of work, at a senior level. The Junior Section is good, as regards the coaching structure, and that approach needs to be replicated ..
I’ve had to make a decision between rowing and coaching .. I decided I was more passionate about coaching, and you can’t do both well. It’s hard to run a coaching session, and then have the energy to go and train yourself . I’ve seen some coaches who start off, wanting their crews to win, and they’re testing and “beasting” people all the time. That’s not sustainable, people will drop out. So, with the womens’ squad, we have a 2 to 3 year plan. There’s 4 sessions a week and people are expected to turn up to 3, there’s no emails about availability, they fit in what they need to do – everyone has different commitments. It’s about being fun and enjoyable – a friendly squad, whilst also getting fit at the same time. It needs to be sustainable. I would like to see something that will carry on whether I’m here or not. On another subject what’s your view on the Mens squad? How ambitious should we be at Durham? I think as a minimum, for the size of club we are, we should aim to be a top 100 at the Head of the River, and to pre-qualify for Henley. This entry was posted in Club News, News on February 13, 2014 by Andy Jaggard. Durham SBH has been cancelled and will not be rescheduled again. Current conditions and the forecast are poor and an early decision is better for everyone. Still some time to get your entries into Tyne next week and hopefully the University Hayward cup will go ahead on Saturday in Stockton if you want to watch some racing this weekend. We we be in touch next week with BROE administrators regarding refunds. Thank you again for your entries and see you at a hopefully Sunny Durham City Regatta in May. This entry was posted in Expired Announcements on February 13, 2014 by admin. 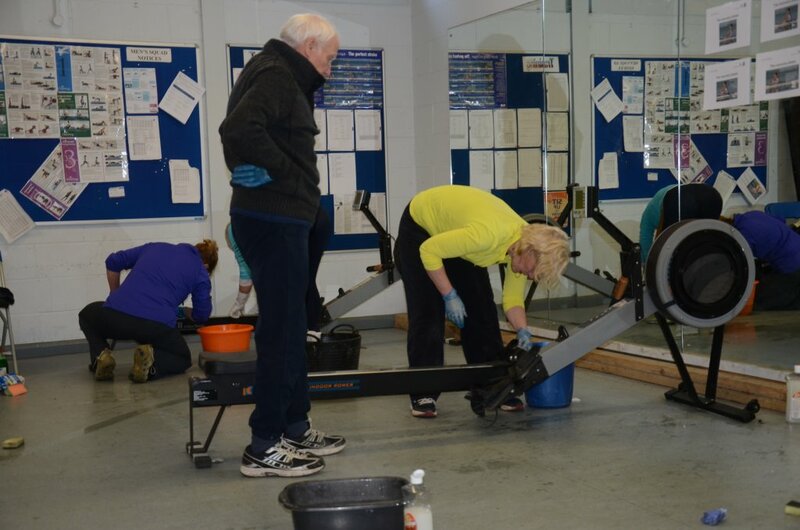 The Rec rowers did a magnificant job yesterday, Monday 10th Feb, to give the gym a deep clean, and the Junior section pitched in to put all the equipment back in place, before their training session. Twenty plus rec rowers spent over two hours on the cleaning make-over with their characteristic enthusiasm. Virtually all the equipment was removed and the floor was scrubbed by hand and then steam cleaned. All the mirrors were cleaned, along with skirting boards, radiators, and doors. And all the ergos were individually cleaned, along with other equipment. 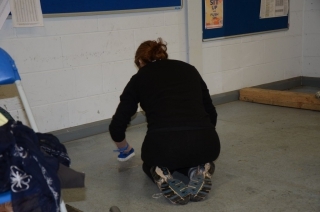 Rumour has it that the Masters Mens squad can’t wait to get the marigolds on, and will be spending their tuesday night de-brief in the bar trying to identify a suitable cleaning project. This entry was posted in Club News, News on February 11, 2014 by Andy Jaggard.